Professional holiday decorating services like Christmas Decor by Arvidson, in Crystal Lake, can enhance your home and your holiday spirit. During the holiday season, there are many people to decorate for. Extended family members come to visit, college students return home, neighbors drop by, and everyone seems to notice the extra effort in decor. But to Dennis Marunde, owner of Christmas Decor by Arvidson, 3209 Illinois Route 31, in Crystal Lake, impressing people isn’t the point. Holiday decorations also add a touch of joy inside the home. Mike Haas, who owns Strawflower Shop, 210 W. State St., in Geneva, with his wife, Susan, finds beauty in his family’s traditions. Whether you’re a novice or a savvy expert at holiday decorating, or somewhere in between, there’s always a new way to add joy. Gather ideas from some of the decorating experts in our region on how you can enhance your holiday spirit. 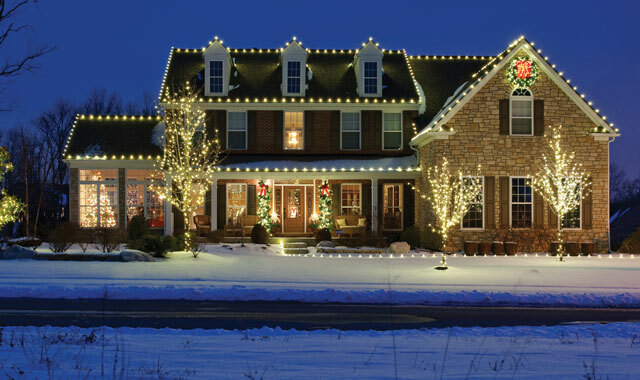 Every year, the Arvidson crew looks forward to cheering up customers by lighting the outside of their homes. Arvidson handles the entire process of decorating home exteriors across McHenry County, Lake County, northern Cook County, DuPage County and Kane County. The company owns its own equipment, so customers don’t need to worry about buying and storing decorations, replacing lightbulbs, or falling from a ladder. Arvidson also maintains its work throughout the season. This year, Marunde notices some new trends. White LED lights have been popular for a number of years, but nontraditional colors have been making a surge. Blue lights, in particular, have been in high demand. Marunde thinks customers should choose whatever colors make them happy. Marunde has seen novel approaches to outdoor lighting, such as wrapping trees entirely in either green or red lighting – sometimes, in an alternating pattern. Lighting around windows has also been heavily requested this season. Arvidson has software that can superimpose lights onto a photo of someone’s home, so customers can get an idea of what the finished product will look like. For those who aren’t used to decorating the outside of their homes, Marunde suggests starting with what he calls “daytime decorations.” Garlands and wreaths on the front door provide a simple way to spruce up the home. If you’re decorating on your own, Marunde suggests staying off the roof and decorating closer to the ground. Small touches, such as garlands wrapped around the mailbox, or small pieces of greenery in subtle places around the property, can easily enhance the look of your home. When it comes to lights, Marunde advocates for LED equipment, as LED lighting lasts longer than incandescent bulbs and produces a stronger light. On past projects, Marunde’s staff has wrapped giant trees in colorful lights and lined rooftops with eye-catching bulbs. For larger commercial projects, the team often gets requests for elaborate garlands and yard ornaments. For most residential projects, however, things are usually a bit quieter. The average residential job takes about half a day for Arvidson to finish, while commercial jobs can sometimes take up to two days, depending on the intensity of the project. It’s always a compliment to Mike Haas, of Strawflower Shop, when people try to copy his store’s creative Christmas decor. When it comes to indoor decorating for the holidays, he believes there are three important areas to keep in mind. Once the tree is adorned with lights, ornaments and other decorations, slide over to the mantle to decorate around the fireplace. Stockings, garland, candles and Strawflower Shop’s decorative present boxes can enhance the area. From there, Haas notices that many people decorate the cocktail table in the same room. However, he suggests walking toward the entryway to find the third most important area to decorate. Because the tree is the most important element, Strawflower Shop focuses much of its decorating efforts on creating elegant trees that span many themes. One of the most popular is a winter woods theme, in which trees are decorated with antlers, miniature deer heads, lanterns, feathers, and, most popular of all, owls. Another top theme appeals more to children. Aside from wintry animals, a classic Santa Claus theme is popular with Strawflower Shop customers, who enjoy the trees decorated in red ribbons, bells and jolly Old Saint Nick. No matter what theme a person chooses, Strawflower Shop’s interior designers can help customers stage their home. Decorating one or two rooms can take anywhere from two to five hours. Haas finds that small accessories make a big impact. Candles can make a particularly nice add-on, while Strawflower Shop’s “presents” look nice when scattered around the tree or placed on top of the mantle. Overall, it’s important to Haas that customers perk up when they come home and see their holiday decor. It’s no secret that flowers can brighten someone’s day. So, the holiday season is the perfect time to visit Countryside Flower Shop, Nursery & Garden Center, in Crystal Lake. The woodsy theme often carries into floral arrangements. Countryside can add birch, owls, deer, foxes, moose and other elements to create a natural, rustic look. Woodland creatures are also popular at Strawflower Shop, which has a floral department that can customize new products or refurbish old silk arrangements. Both Strawflower Shop and Countryside are accustomed to adding evergreen, berries, ribbon and silks into an arrangement, so that it’ll blend in with a customer’s home. Changing up the silks and ribbons can especially refresh decor and make it festive, Braglia says. This entry was posted on Wednesday, December 7th, 2016 at 12:00 pm	and is filed under Home & Garden, Top Posts. You can follow any responses to this entry through the RSS 2.0 feed. Both comments and pings are currently closed.